Only steps away from the beach, this hotel offers the sensation of a tropical island while being minutes away from a large urban hub. From poolside cabanas and pool deck games to daily yoga classes and nature walks one never has to leave the hotel to feel content and relaxed. When you’re craving a little city adventure, however, just jump on the free shuttle to Downtown Coronado and from there to San Diego for a little city strolling. In addition, the resort offers four restaurants and bars that focus on locally grown, farm-fresh produce and ingredients to capture the unique flavor of Southern California morning, noon, and night. The IECA room block is fully committed at the discounted group room rate at $239/night plus tax for the Resort View King and Resort View Double room types. However, the Partial Bay View King and Partial Bay View Double room types are available at the discounted group room rate at $279/night plus tax via the IECA room block. Book your room today online here or by calling (800) 235-6397. *Reference IECA when making your reservation to receive the group rate. The IECA has a limited number of rooms on hold at the discounted group room rate of $239/night plus tax. If you are in need of a room at this rate, please contact Tatiana Veres, Membership and Meeting Coordinator via email at tveres@ieca.net or by phone at 856-793-0910. 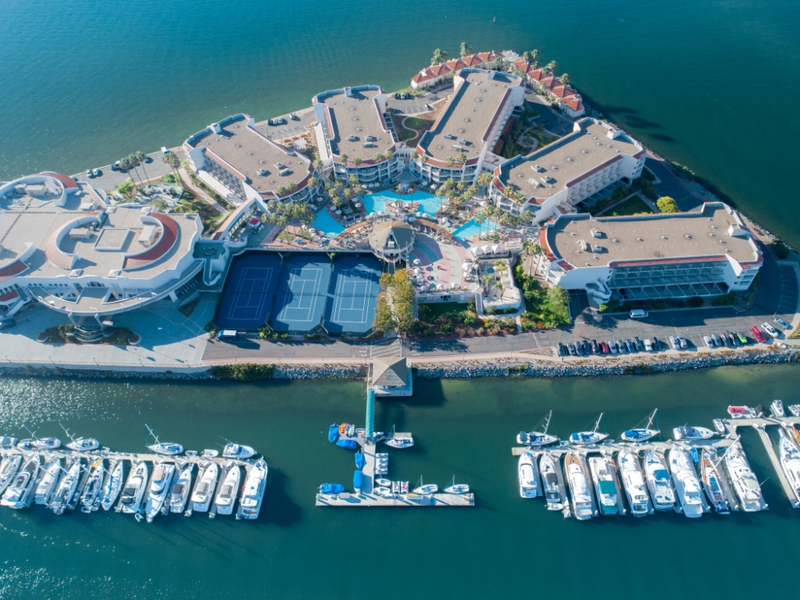 San Diego International Airport (SAN) is located 18.8 km/11.7 miles from the Loews Coronado Bay Resort, approximately 20-minute drive to/from the hotel. Please note there is no complimentary shuttle to and from the San Diego Airport and Loews Coronado Bay Resort. Below you can find many other ground transportation options to and from the airport. The IECA has secured with United Airlines discounted rates on flights to/from San Diego International Airport (SAN). When booking your travel with United Airlines, use the IECA's Meeting Z Code ZGB5 and Agreement Code 431596 to receive discounts of 2% to 10% off published fares. Reservations can be made by calling your professional travel agency, available online via united.com and by calling United Reservations Meetings Desk at 800-426-1122. For passengers outside the US 50 States & Canada, you can also email groupmeetngs@united.com and provide your preferred itinerary, agreement code, and meeting Z code. Please allow 24 hours for email requests to be processed. Many companies provide taxicab service at San Diego International Airport. If you need a taxi, simply follow the signs leading to the Transportation Plazas. A Customer Service Representative will place you with the first available taxi, unless you specify a particular taxicab company. A list of companies can be found here. Several companies, like Uber and Lyft, offer Ride Share services at San Diego International Airport. Travelers can be dropped off curbside at both Terminal 1 and Terminal 2. Shuttle vans and buses operated by off-airport companies are another transportation option. Shuttle service is available at the Transportation Plazas across from Terminals 1 and 2. IECA has partnered with Hertz for discounted rates on rental cars. To reserve your special meeting rates, please provide the CV# 022Q9254 when making reservations. You can make reservations online by clicking here or by calling Hertz Meeting Services directly at 800-654-2240 (US and Canada), 405-749-4434 (outside the US and Canada). At the time of reservation, the meeting rates will be automatically compared to other Hertz rates and you’ll be quoted the best comparable rate available. For driving directions to the hotel, click here.